We were extremely honoured to be invited to provide our services for the recent high profile state visit by Pope Benedict XVI. Working for marketing and event agency WRG, organisers of both the Twickenham and Birmingham events, we were asked to deliver a scenic package in support of the Beatification Mass at Cofton Park, Birmingham. Amongst the items we were responsible for were the extensive cladding to the main stage; raised platforms and treads on and to the side of the stage; the construction of the backdrops and also dividing walls separating the stage from the Sacristy behind. Several Bishops’ chairs and stools were handmade from Ash and a further 28 painted Bishops’ benches were also provided. 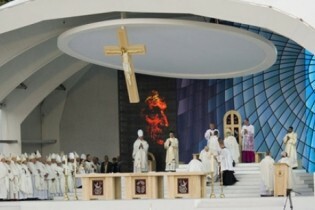 Above the stage we provided a flown ceiling and a mounted a hand crafted three-metre cross, depicting a figure of Christ. The figure was shaped using our CNC facilities and beautifully hand painted by our scenic artists. Finally, we created the Sacristy to the rear of the stage. This area consisted of a series of private rooms for the use of the Pope and his entourage and was completed to an extremely high specification.